Content marketing has been a major trend that’s likely to continue into 2014 and beyond as brands hone their content strategy and use it in innovative ways to engage and attract customers. A recent Curata survey of 500 marketers found that nearly three-quarters of marketers surveyed plan to invest more in content marketing this year, concentrating on technology and people, both internal and external. In organizations that don’t have a dedicated content marketing team, content creation usually falls to other marketing employees, who are typically already over-burdened with other tasks. This means that content marketing can get pushed to the bottom of their to-do list. However, with brands increasingly understanding the value and importance of content marketing, many are now building a dedicated content development team with a content strategy executive at the helm. Often, members of this content development team have a journalism background rather than traditional marketing experience. This enables them to think like storytellers and journalists, rather than bloggers, to present stories in a credible and interesting manner. 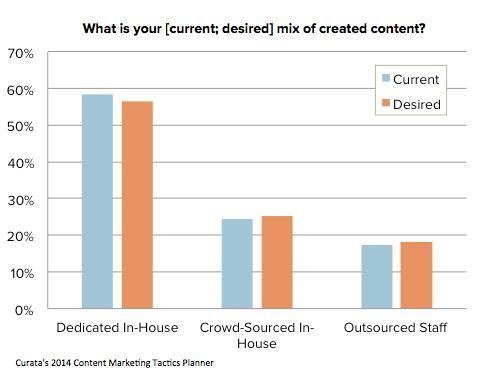 What this means to you: Finding the right combination of content creators is different for every organization. Take a step back and look at your overall marketing strategy and what works for your prospects to draw them in. Is it blog content on your own site? Is it video? Is it webinars? And hire to fit the right needs for the right content. Most importantly, ensure that you’re writers are able to create content that is relevant and at a detailed enough level to provide clear value to your audience. Running out of content ideas? Crowdsourcing across the minds of your organization is a great way to discover relevant, fresh content. Initially, many brands kept most of their content creation efforts in-house because they lacked an efficient way to manage outside content producers or didn’t see the value. Moving forward, however, more companies are increasing their internal resources to better manage freelancers and to develop their own content. Why? Two reasons. The first is that some new entrants to the content marketing realm are niche segments, and in some cases, they’re very technical areas that require more expert knowledge with regard to creating content - which many freelancers don’t have. The second reason is that first-class marketers are learning that if they offer high value content to their audience, (the type of content that exists in the minds of their own employees) they can increase customer engagement, thought leadership and brand awareness. What this means to you: While hiring someone internally to lead content is important, it might be difficult to build an internal team on a small budget. Content marketers can better inform and manage freelancers to instill their brand messaging in outsourced content. This will allow for an increase in content creation without the expense of hiring more employees. In our most recent survey, we found that best-in-class have a desired mix of internal and external resources to help get the job done. In the early days of content marketing, marketers use a patchwork of tools to plan, create, market, and measure their content. For example, they jot down ideas in a notebook or on a Post-It, draft blog posts in a Word document, keep a shared editorial calendar on a whiteboard, etc. Even today, many content marketers are using this duct-tape method. However, thanks to tools designed specifically for content marketing, best-in-class content creators can collaborate with each other and perform many of these same tasks using specialized software to help streamline the process. Already, 56 percent of the marketers Curata surveyed use free tools, vendor software, or internally developed tools. What this means to you: What is your biggest content marketing challenge? Is it staying organized? Getting enough content published with a limited staff or budget? Looking into the content marketing tools available can help resolve these issues and get your content strategy up to speed. Content management tools can keep your writers on schedule and all of your content materials in one place, while curation tools allow organizations to publish relevant, high quality content daily even with a limited staff and marketing budget. Often, identifying the next great content idea can also be a challenge. Content curation can help organizations discover new topics from other industry thought leaders. Curating these articles helps marketers brainstorm fresh content ideas. These three areas are likely to play an increasing role in content marketing this year and beyond. 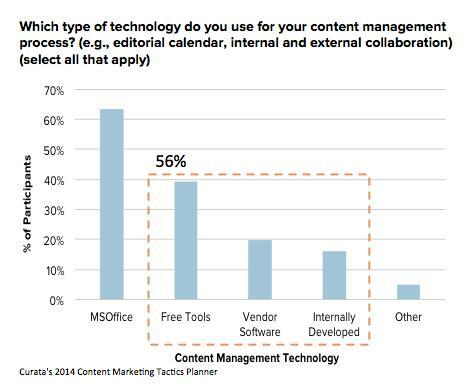 To read more about the new strategies of successful content marketers and the influence of technology, download the Content Marketing Tactics Planner 2014. Michael Gerard is Chief Marketing Officer at Curata.